In this example, only a table from a single page will extracted for demonstration purposes. For a full example that covers several pages, see the catalog_30s.py script. There are also some more demonstrations in the examples directory. The page has been scanned and processed with Optical Character Recognition (OCR) software like ABBYY FineReader or tesseract and produced a “sandwich” PDF with the scanned document image and the recognized text boxes. Although some software, like FineReader allows to extract tables, this often fails and some more effort in order to liberate the data is necessary. We can use pdftabextract together with some other other tools for this. We generated an XML which consists of several page elements, containing an image element (the “background” image, i.e. 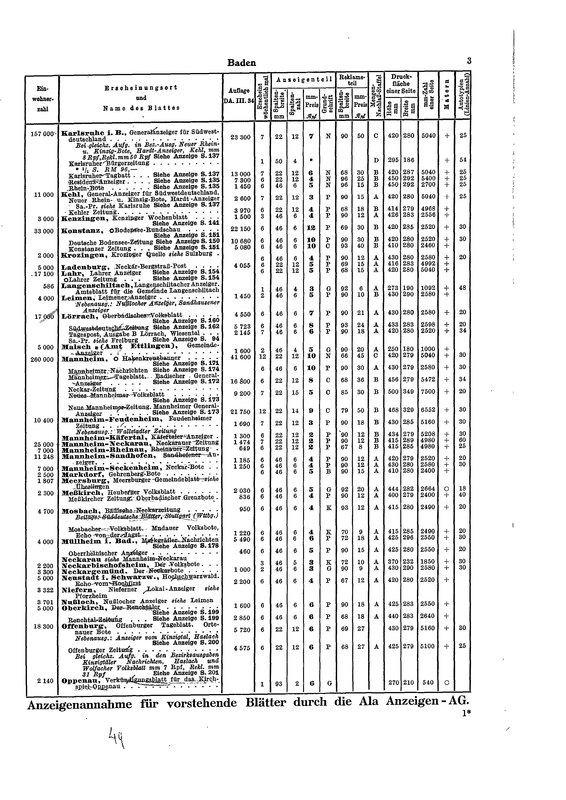 the scanned page) and several text boxes (text) with coordinates and the respective text box value. 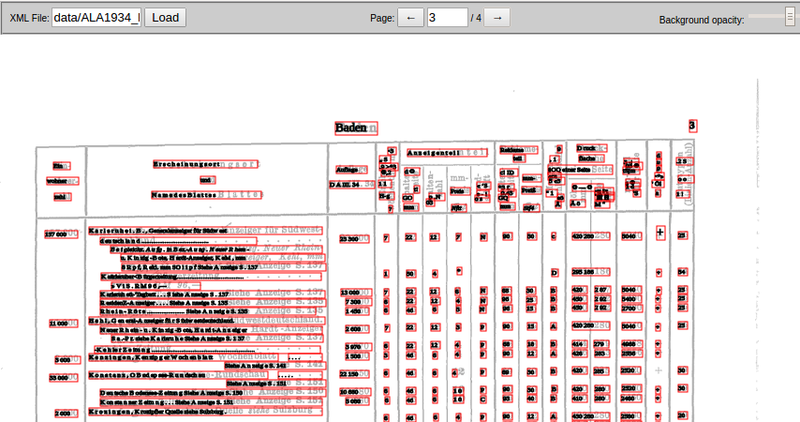 You can download the pdf2xml-viewer from its github page. It basically consists of an HTML page that allows you to inspect an XML file in pdf2xml format in your browser. We can now start to use pdftabextract in Python code in order to load the XML file. By now, you should have installed pdftabextract via pip in the Terminal with the command pip install pdftabextract. Let’s define some constants first that we will need throughout the script. Now we can load the the XML, parse it and have a look at the third page (the page from which we later want to extract the data). The text boxes in p['texts'] contain the coordinates and dimensions of each text box as well as the content (value) and a reference to the original XML node. 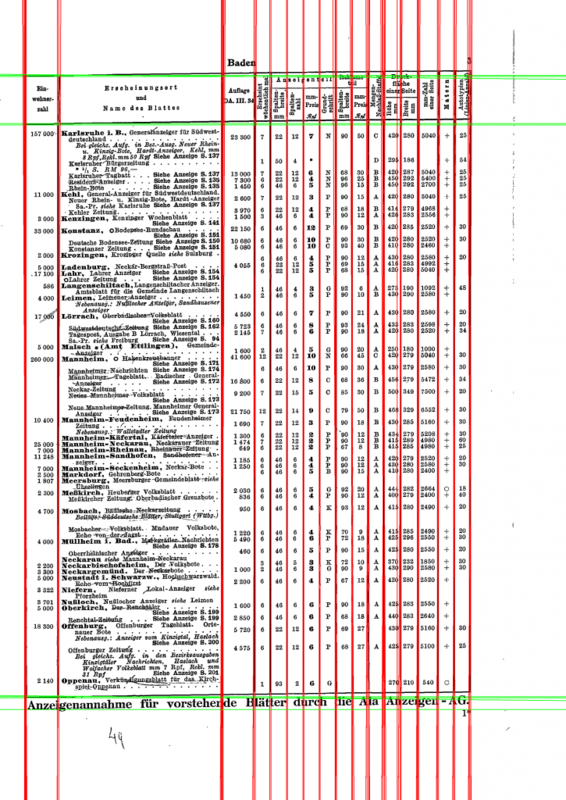 We can see on the scanned page image, that columns and table headers are marked with straight lines. We can detect these in order to a) find out if and how much the page is skewed or rotated and b) later use the detected vertical lines to estimate the position of the columns in the table. In order to do so, we can use the image processing module (pdftabextract.imgproc) which uses OpenCV’s Hough transform to detect the lines. The important thing is that we created an ImageProc instance using the scanned page image file that is referred to in the image key of the page p. ImageProc will identify the dimensions of the image file which allows us to calculate the scaling between the image dimensions and the text boxes’ coordinate system. It is important to understand that the coordinate system in image space has a different scaling than the coordinate system used to position the text boxes. For example, the image could be scanned with a size of 1000×3000 pixels (iproc_obj.img_w by iproc_obj.img_h) while the text boxes of a page are positioned on a canvas of size 500×1500 units (p['width'] by p['height']). Now the most crucial step is to detect the lines and use the right parameters for the image processing step. At first, our image will be converted into a binary image with white pixels marking the edges in the image (i.e. the regions with a big change in color intensity) and black pixels showing regions of homogenous color, i.e. low change in color intensity. To achieve this, the Canny algorithm is used. The kernel size is the size of the Gaussian Filter used to smooth the image and remove pixel noise. The low and high thresholds are used for detecting “strong” and “weak” edge pixels during Hysteresis Thresholding. After this, the actual Hough transform is taking place. All white pixels (i.e. edge pixels) are transformed into “Hough space” which is a descrete approximation of a polar coordinate system with theta being the polar angle and rho being the distance from the origin or “pole”. This Hough space can be seen as a 2D map with theta being on the y-axis and rho on the x-axis. The map must have a certain resolution or size which is given by hough_rho_res and hough_theta_res. During Hough transform, each edge pixel p is then converted to polar coordinate space and n = PI / hough_theta_res lines (in the above example 500 lines) are simulated to pass through that pixel in n different degrees. This forms a sinusoid which will intersect with other sinusoids when other edge pixels are on the same straight line (because this pixels share the same angle or theta and distance or rho of this straight line). So for each edge pixel, a number of potential lines going through that pixel is simulated and then accumulated on the Hough space map, a process which is called voting. The more intersections appear on a certain spot in the Hough map the higher is the vote. All votes that are above a certain threshold here given by hough_votes_thresh are then considered being straight lines. So hough_theta_res defines the minimum line angle that can be detected (in our case: PI/500 = 0.36°) and hough_rho_res the minimum distance delta. hough_votes_thresh is the minimum number of intersections (and hence about the number of edge pixels on a straight line) in the Hough map for a straight line to be detected as such. We should now have a look at the detected lines in order to verify that we chose the right parameters. But at first, let’s define a helper function for that because we will need it another time. We see that the horizontal lines (green) are not straight, whereas the vertical lines (red) are. 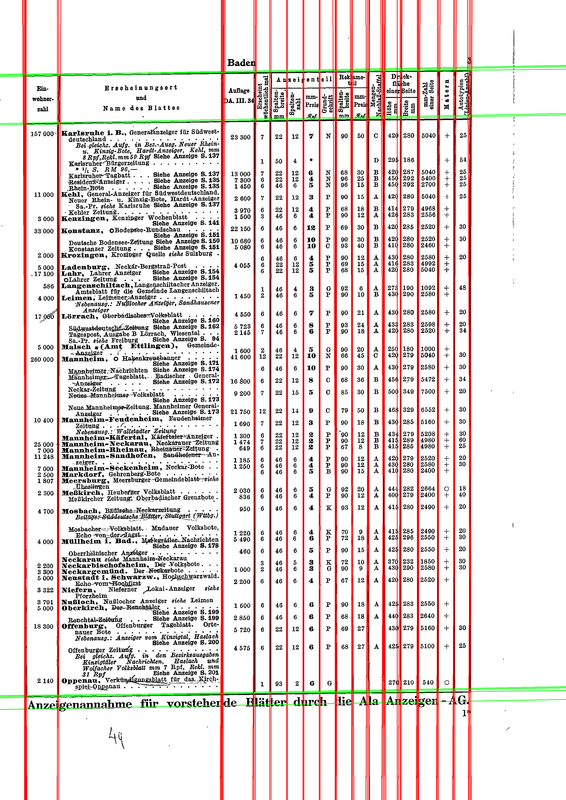 This means that the page is skewed so that the text boxes in the left are slightly shifted down in relation to those on the right of the same row (this can also be seen in pdf2xml-viewer). In such a dense table, this would bring serious problems during row detection, so we will need to fix this. The method find_rotation_or_skew can be used for that. rot_or_skew_type, rot_or_skew_radians = iproc_obj.find_rotation_or_skew(radians(0.5),    # uses "lines_hough"
We can see that a skew in direction sy (meaning vertical direction) is detected. To fix this, deskew_textboxes is called with our page p as first parameter, then the negated skew (negated in order to “skew back”), the skew type (direction) and the origin point about which the deskewing is done (top left corner). We fixed the text boxes in the XML, but we should also fix the actual lines that were detected. This can be done with the method apply_found_rotation_or_skew. Additionally, we save the image with the repaired lines. As we can see, only the horizontal lines are straightened. Please note that the deskewing is not applied to the original image because this is not necessary for our further processing and hence the repaired lines are now a bit off from the table borders in the original image. We now want to identify the columns of the table on our page. We already obtained the vertical lines by the means of image processing. Now as there are always many close lines detected for single column separator line, we need to cluster these sets of close lines so that we can later calculate the column positions. We can use the find_clusters method to which we need to pass the direction of lines that we want to cluster (vertical lines) and a clustering method. Here, we will use a simple technique that orders the lines and arranges them to separate clusters when the gap between them is too big (i.e. exceeds dist_thresh). We use the half of the minimum column width for this threshold. We can measure this minimum column width in advance with a graphics editor like GIMP. You can also use other, more sophisticated clustering techniques here too, which are implemented in pdftabextract.clustering, e.g. hierarchical clustering. But usually this approach here is sufficient. remove_empty_cluster_sections_scaling=page_scaling_x,  # the positions are in "scanned image space" -> we scale them to "text box space"
Now we simply calculate the centers of the clusters, by default taking the median of the cluster values. We also need to divide by the page scaling because the cluster positions are in image space but we need the column positions in “text box space”. For the row or line positions in the table, we can’t rely on optical features because there are no row separator lines. 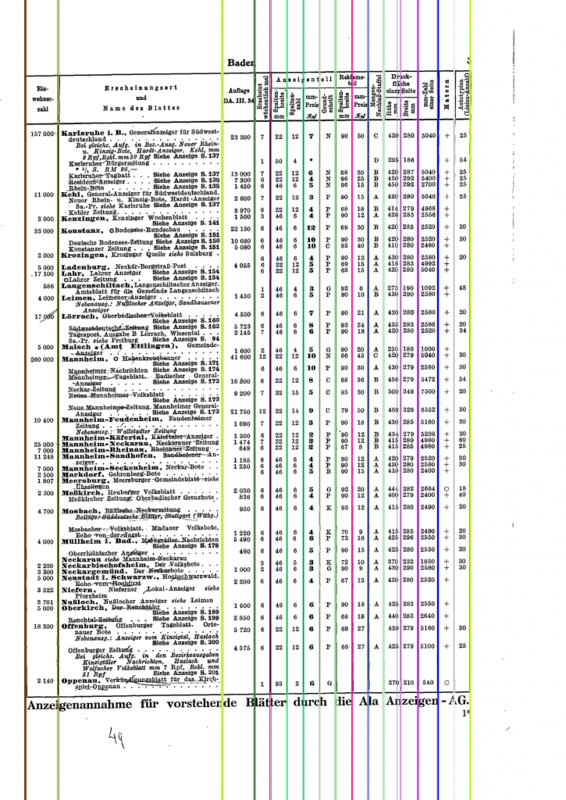 However, we can exploit the distinctive distribution of y-coordinates of the text boxes and cluster them in order to get an estimation of the row positions. Another challenge is to find the start and the end of the table. We can do so by analyzing the specific contents of the text boxes for hints that the first row starts (it must start with a population number on the left) or that the text box is the table footer (it has something to do with “Ala Anzeigen”). We start by finding text boxes of “usual” height in the first two columns, because the text boxes in these columns are most reliable in determining the row position. # we will only use these text boxes in order to determine the line positions because they are more "stable"
Now we get the text boxes’ top and bottom border positions, cluster them, and calculate the cluster centers. Next we try to find the first table row by checking when we find the first text box that contains a string which matches a typical row pattern. We find the last table row by checking if we find a “big” text box in the lower page area that matches certain words. From the column and row positions that we detected, we can now generate a “page grid” which should resemble the table layout as close as possible. We then save the grid information as JSON file so that we can display it in pdf2xml-viewer. We can see that the rows and columns were detected correctly (decrease the background image visibility for better display) and the deskewed text boxes mostly lie in the correct table cells. So the only thing left now is to finally extract the data by fitting the text boxes in the correct table cells. We can use fit_texts_into_grid to fit the text boxes into the grid and then transform it to a pandas DataFrame. B e i gleichz. A u fg . in B ez.-A u sg …. 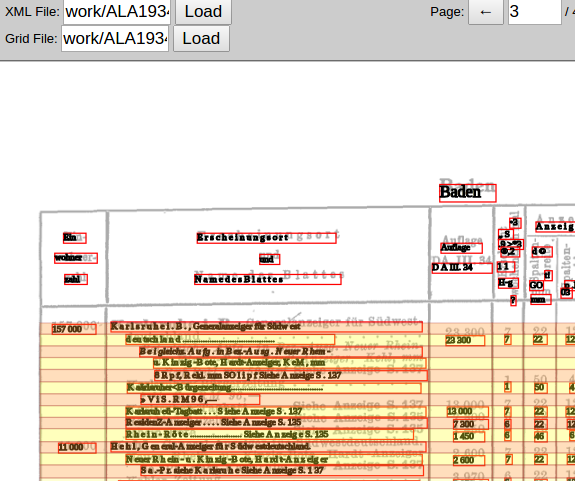 It’s certainly challenging to extract data from the tables of sources like old, scanned documents. From my experience, there is no “one-size-fits-all” solution because of the many different table layouts and often missing visual markers (table cell borders) as well as the problems with rotated or skewed pages. Both tools, pdftabextract and pdf2xml-viewer provide a way to write tailored scripts by providing lots of useful classes and functions while keeping the necessary flexibility to handle such complicated data mining cases. Other examples in the github repository for example show how to handle documents that do not feature vertical lines marking the columns.